Three years ago I started writing the Swing-Knitting™ tutorials and patterns for short row designs – exactly 3 years ago I published the first Swing-Knitting™ workshop! The Ravelry group I founded Dec 31st 2010, the group has more than 3000 members now! That’s a reason for having a party!!!!!!!! 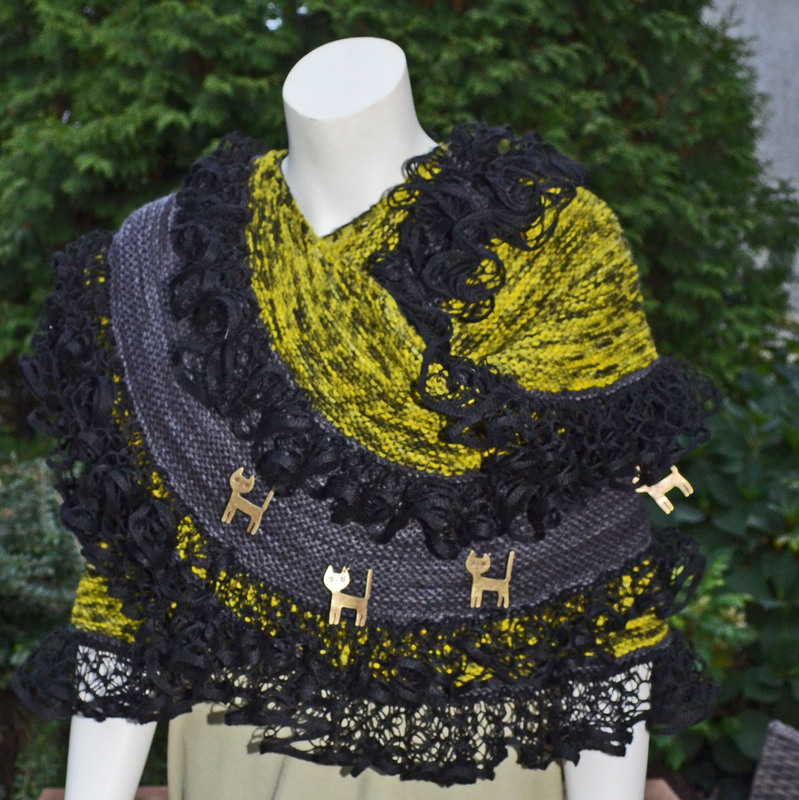 My hug for you: The pattern for the Santi wrap you’ll get for half the price until Dec31st! The coupon code is Swing3. “Santi“ is a hai tian word and means “feeling good and comfortable“. This is what I want this wrap to be for you! Knit it for you or a good friend as a means of happiness, as a comfort, as a loving hug. You can knit it without any prior knowledge about short row knitting! 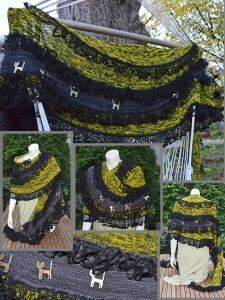 You can adapt this wrap to every season or theme by the way you choose your colors. Knit it as a Christmas wrap with red, green and white. Knit it for Halloween with pumpkin colors and black. 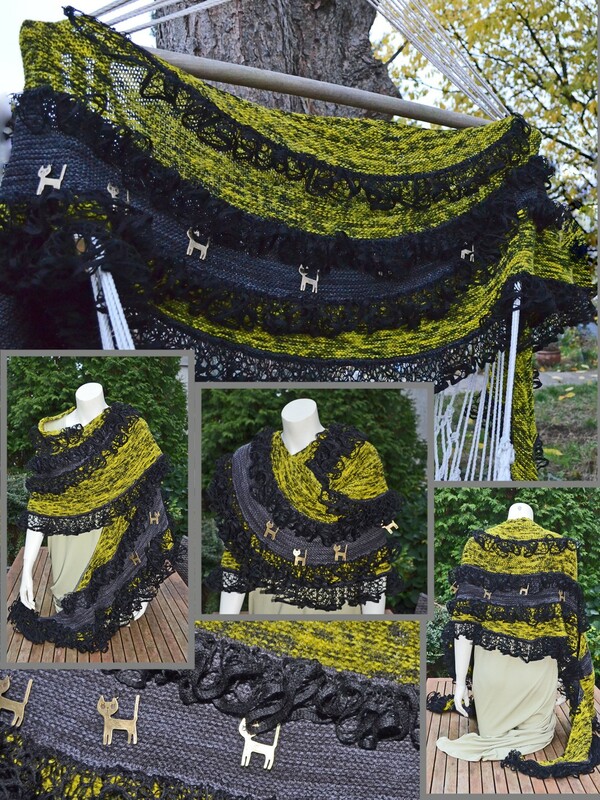 Knit it as a Spring wrap with light green and hand dyed flower colors, as a Summer wrap with water colors …. 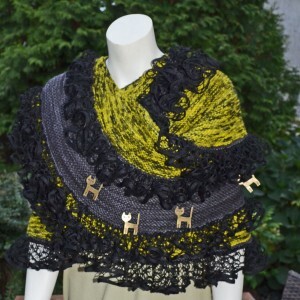 Use your imagination and knit the wrap in your favorite colors! I knitted my Santi in Drachenwoche Wolkenschloss in hand died color “coven free dance” and semisolid grey. If you knit the wrap with DK yarn (200m/ 100g) and needle US8, as I did, your wrap will become as large as mine. If you use a thinner yarn as sock yarn, your wrap will become smaller and you’ll need less yarn. 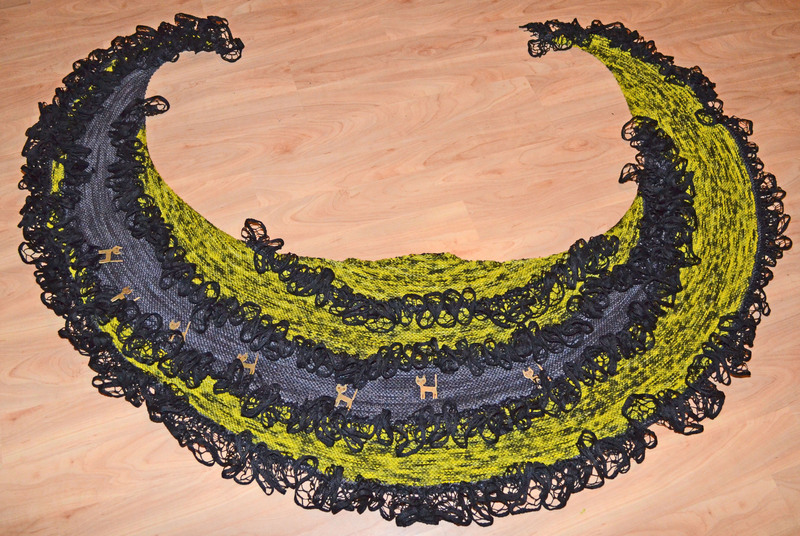 The ruffles are made by attaching a ruffle yarn / shawl yarn directly while knitting. You can use a ruffle yarn of your choice, and you can knit the wrap without ruffles. Most of the wrap is done in garter stitch. How to knit the different increases on the edges and how to cast off in a very elastic way or with an attached I-cord, I’ll explain to you. Some parts of the wrap are shaped like wedges. I use German short rows to form these wedges, and I’ll show you how to make the double stitch after turning the short row. How to attach the ruffle yarn I show you in detail. More about Santi you can read in my pattern description on Ravelry and at mynd beim Ravelry project page.